White peacocks or white peafowls are beautiful, unique and rare white leucistic birds and they look really stunning and amazing. They are often mistaken as albinos, while in reality they are leucistic. In fact many leucistic animals and birds are often mistaken as albinos. Interestingly, this condition is also described as "albinoid" which means leucistic. The similarity in words "albinoid" and albinos shouldn't misguide you since these are different conditions. Albinoid means leuicistic or have the condition of leucism while albino means the condition is albinism. Being albino means there is a complete lack of pigmentation which is usually a congenital condition, while being leucistic or albinoid means there is a partial lack of pigmentation. Blue Peacocks known as the Indian peafowls are one of the most popular birds admired by most of us for their beauty. The white colored peacocks are rare, but they too look stunning. 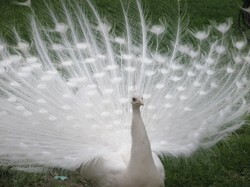 The white peacocks are white in color due to the lack of pigmentation in the skin and feathers, even though this is rare in the wild but more common among those kept in captivity due to selective breeding. Many times white peacocks are mistaken for albinos, but for albinos there is a complete lack of the pigment melanin which also results in pink eyes. The white peacocks have beautiful blue eyes (and sometimes few colored feathers too) and so they can't be considered as albinos. You can find a lot of information about peacocks in the below shown ebook which you can buy from Amazon by clicking on the image. You can click on the above picture of the canvas print if you wish to check the product details or if you wish to buy it from Amazon. The amazingly beautiful painting shows white and blue peacock pictures, which is a rare and unique art that look stunning too. 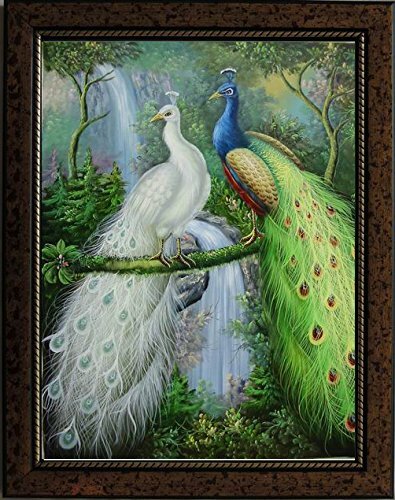 This is sure to please those who love decorative peacock images which can be used for home decor and it makes a great unique gift for peacock lovers! Be it any color, the word peacocks refer to the male birds and the female birds are called as Peahens. They are collectively called Peafowls. However, the word peacock is more popularly known and so most of the people address both male and female birds as peacocks. White peacocks are same as the blue Indian peacocks in size, behavior and other characteristics, except the fact that they look white in color. This is due to the lack of pigmentation in their skin and feathers and the condition is thought to be caused by a mutation in genes. 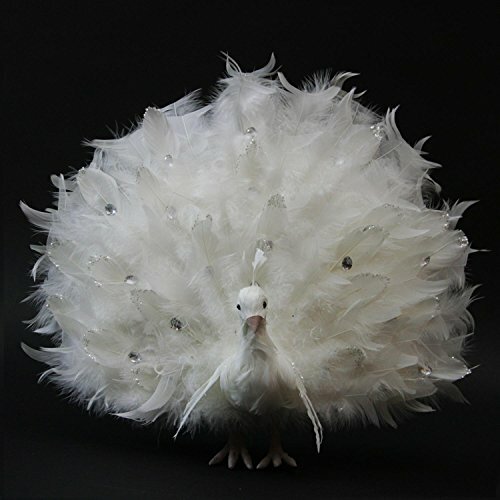 See the images of amazingly beautiful looking white peafowls here. Albinos lack the pigment melanin and there is a complete absence of this pigment in them including the eyes which results in pink eyes due to the visibility of underlying blood vessels. In leucism, there is an overall reduction of all pigments and this doesn't normally affect the color of eyes. In the case of white peafowls, the skin and feathers of the bird look white but the eyes look blue in color. Actually even in the peafowls that look purely white, if you look through a microscope you can still see little color in the feathers. Although rare, peafowls with a mix of blue and white feathers are also found. Peacocks are always a great subject for art, irrespective of the color. It is the male birds which look more beautiful than the female birds and they are more popular. Peacock dance is also very famous, and there is a belief that they usually dance just before a good rain. I do not know if that's true, but I am sure they are great dancers! The use of peacock designs in apparels, home decors and also hair accessories make those things look so beautiful and special. This is especially true for blue and also the green peacock designs, but the white peacock paintings and also the white peacock home décor items look equally beautiful and they make great gifts. We have already seen above a great piece of art with white and blue peacock paintings which looks stunning, that is an example of great peacock art. 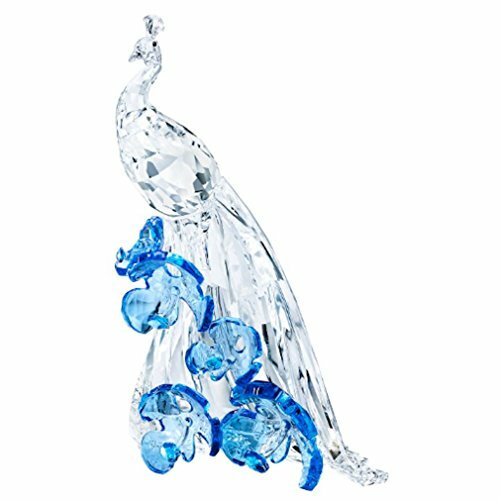 Below you can see beautiful and decorative white peacock themed gift ideas for peacock lovers including an amazingly beautiful Swarovski crystal figurine. 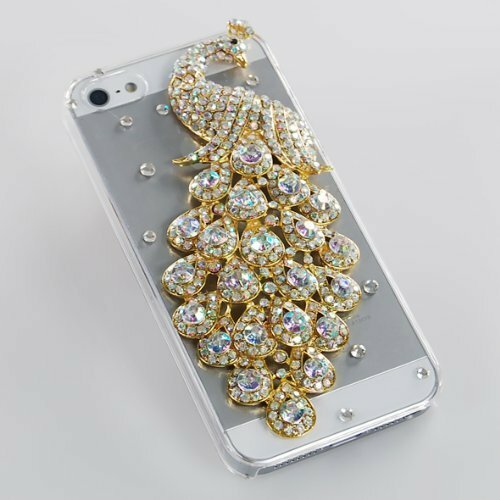 Check them out if you love white peacock gifts. If white peafowls are leucistic, then what kind of animals and birds are actual albinos? 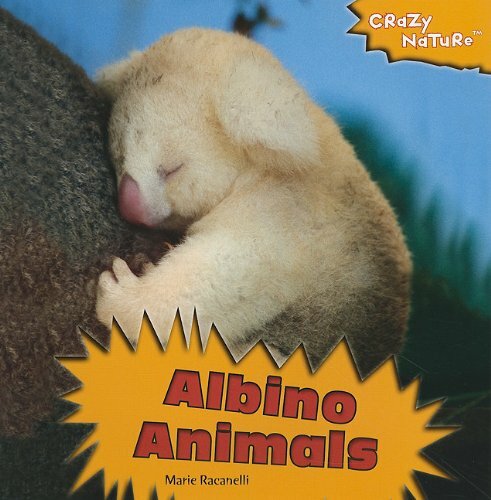 See the below book that covers all about albino animals. Have you ever seen White Peacocks? I live in Miami. In my neighborhood of Coconut Grove we have many wild peacocks and one white peacock. Thanks :) They are really very beautiful birds. I hope you get to see one. Wow! I've never heard of, nor seen, a while peacock. These are beautiful! VioletteRose, I came back for a second visit. 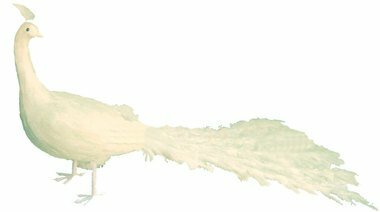 These white peafowl are simply stunning. Thank you all :) I am really glad to read all the comments on white peacocks. I never knew there were white versions as well as blue/green peafowl. There are very vocal blue peafowl in the park at Benalmadena in Spain, allegedly from the smallholding of an old man who let his menagerie loose in the park before he died. At which point the park authorities promptly took possession of his land and made it part of the park too. VioletteRose, The batik of the white and blue peafowls by Olena Leonova spotlights the white version's beauty. White peacocks are stunning, too! I loved the info on your page, and, like Emma, I think that peacock-themed set of cup, saucer and spoon is quite creative! I'm pinning this article about these beautiful birds to my Peacock Feathers board.